On Monday, January 7th, 2013, Daytona racing legend George S. Waltman of Honesdale, Pennsylvania passed away at the age of 87. Most endurance racing fans were unaware of exactly who George S. Waltman was unless you heard mention of him on the Speed Television broadcast of the recently concluded Rolex 24 At Daytona. George was a very special man in many ways. Not only did he serve with the Army Air Corp as a B-29 pilot in the Pacific Theater during World War II but following the war he worked as a pilot for British Air. Later he became an engineer for Jaguar-British Leyland and in that capacity dabbled in auto racing in the Bahamas, Sebring, Daytona, Bridgehampton, Lime Rock and Watkins Glen. 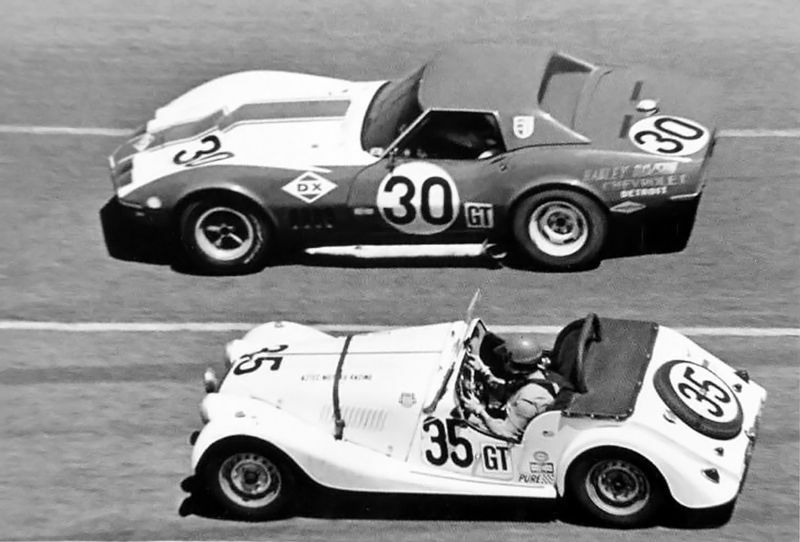 His greatest claim to fame and what has endeared him to anyone who has ever watched a sports car endurance race or ever dreamed of driving in one is that George S. Waltman is the only person of his time to drive and complete the 24 Hours of Daytona without benefit of a co-driver. The year was 1968 and not only did George drive solo in the Daytona 24 but he also did it without benefit of a pit crew. And, as they say on TV, “But, that’s not all!” George drove, did not trailer, his Aztec Racing Morgan Plus 4 to Daytona from his home in Great Neck, New York, a distance of over 1,000 miles. During the 24 hour race George complied with FIA driver rules requiring a rest break of one hour after every four hours on the track by servicing the car, taking a nap or getting a bite to eat. When leaving the pit area to “take care of business” he would place an “Out to Lunch” sign on the car. With no pit crew he had to fuel the car himself, change tires and do other maintenance or repairs. No doubt he took advantage of all the freebies being offered to racers from the automotive vendors at the track in exchange for placing their decal on his car. It was also reported that some of the other racing teams may have assisted the intrepid driver where they could. George’s Morgan Plus 4 was one of the last race cars running when the checkered flag fell and he is listed as finishing 30th overall, 335 laps behind the winning Porsche Works Team 907. Even more amazing was that he was only five laps behind actor James Garner’s AIR team Corvette that had four drivers including the likes of Ed Leslie and Scooter Patrick. This was not George’s first attempt at a solo drive in an endurance race. In 1963 he completed the 12 Hours of Sebring without a co-driver finishing 37th overall out of 42 finishers driving a Triumph TR4. No doubt this gave him the confidence to tackle the Daytona 24 alone. Regardless of what era of racing you might be thinking of, to enter and finish a 24 hour endurance race alone is nothing short of amazing and George S. Waltman will forever remain a legend from the “Golden Age of Endurance Racing” and for all of us a Daytona 24 legend. One last amazing tale about George. After the 1968 Daytona 24 was over he posed for some photos, got himself cleaned up, changed the oil in the car, checked the tires and drove the car back home to New York. Rest In Peace George S. Waltman, my hero. I never knew George, but I remember the announcers at Sebring and Daytona informing the public. Fantastic. I don’t know if he was a great driver in terms of skill, but he surely was a GREAT sportsman. Thanks, Lou, for reminding us all. I am sorry to hear that I was unaware of George until this article. All I can say is – what style! Very occasionally in racing, the actual race result is of little importance – it’s how you go about doing it. This is, without doubt, the most worthy 30th place finish I have ever heard of. Great Story Lou, This is the first I have heard of this Gentleman. I have also raced Morgans in various parts of the world, but can honestly say I would never want to be sitting in one at race speeds for 24 hours, minus the compulsory FIA stops… This says a lot for the Morgan +4, which is in my estimation, as a ex International race driver myself, about the closet one can get to race car handling on the road. And yes, I have won races with my Morgan, then driven it home some hundreds of kilometres. George will now go into my book of heros on the race tracks of the world…Thank you Lou for giving us this insite into a fantastic achiever. George was quite a guy! Thanks, Lou, for doing this story on him and his Morgan. I was there in 1968 to cheer him on, with my Dad and brother. Still vividly remember the incredible cheer of the crowd every time he got back in the car and fired it up. He became the “underdog hero” of the race. It was an incredible feat of endurance and perserverance, one I never forgot. True Enduring Sportsman. Great memory. I was privlidged to know George for the past 10 years. He was my neighbor in NJ and a special friend to my father during his final years…..both were WWII pilots and MGTC owners from new in 1948 until they departed this life. George raced his TC at the first Bahamas Speed Weeks in 1954 and like the Mogan at Daytona and his Triumphs at Sebring the TC was driven from NY to and from the Bahamas. He then drove the TC back to the Bahamas for a reunion race in the 1980s. George participated in the famous Formula Libre race at Lime Rock in 1959 and returned for the reunion race in 1989…both times in his Testsdoro. Just a few of the accomplishments of George Waltman. George was just what a Gentleman Racing Driver should be and he was an inspiration to me. I remember George as a great Brit car enthusiast. He was the British Leyland rep when I worked as a mechanic and warranty claims writer at Mid Island Imports in Hicksville, NY. He had a great sense of humor and always fun to be around as he just came across as one of the guys. Well done George. Men Like George are why I have been Vintage racing , since my late 20’s when everyone else my age was racing modern cars……..
George and I have pen pals for years, ever since his legendary solo Sebring drive, while I was recording “Sounds of Sebring.” Thanks so much for this beautifully written memorial piece. In one of his notes to me, George stressed that his favorite car was his FIAT Topolino! I remember George well, especially for the 1968 24 hours of Daytona. People from several teams came over and helped him during the race, he drove well and stayed out of everyone’s way, and that was appreciated by many drivers. Great story Lou. George must really have been an independent thinker! I entered my Corvette in the late seventies and ran the first and last hour only, but never would have thought about doing the whole thing four hours on, and one hour off! He has my respect as a real “original thinker”. I knew George (Giogio) many years ago, when he had his little shop in Great Neck. He had a wonderful sense of humor and kept his little show warm with a pot bellied stove in the winter time. He had a wonderful collection of cars that would make anyone smile..his very clean TC, a 500 Fiat, a red TR3, a very quick Frazer-Nash Le Mans replica and his little Testa D’oro, a Fiat powered ‘monoposto’ which he ran at Lime Rock back in the day. He probably had others stored away at his farm in Pennsylvania as well. George had a wonderful sense of humor and I am sad to hear of his passing. Lou, thank you again for remembering a very unique individual. I had the pleasure and honor to have been in that race with George. Even though it seemed as though you were passing him TWICE every lap . . . . He drove quite well and was ALWAYS most courteous with his scarf “just a blowin’ in the wind”. RIP George Waltman neat INDIVIDUAL ! !. Wish I could have met George , Fascinating gentleman racer for sure . Bill Boye your pretty cool yourself! Thanks Louis for the unprompted but flattering article. Also thanks to all of the nice responders. It’s been a difficult month and It’s nice to hear good stories from people that knew him. As a Triumph Tr4a owner for many years, this story brings back the absolute best years of my whole life. What a glorious life he led. Long live British sports cars. Driving to Daytona in your race car, then solo driving the race with no pit crew is so wild B.S. Levy (Last Open Road) couldn’t have even dreamed that one up. Great story (though this does not come as a surprise – it’s Lou writing, after all) , thank you for sharing it Lou – once again, truth best fiction hands down! What a guy! This link has more details about the Testa D’oro that I believe was George’s. It seems that it was actually a ‘Daniela’ as the link points out…no matter, it was a lovely little red car that George cared for a great deal. I think he was also very proud of the Frazer-Nash that I got a drive in long ago..that was a lot of fun, indeed..not a car you see on the street very often! For his family, my condolences and well wishes. After a long time and after further searching, i believe this link provides the details of the Testadoro, enjoy! Another great story from Lou! The O’Malley Daytona book says in the text that Waltman was the last of 32 finishers, though the results have him 34th with Vestey’s Ferrari 35th and last runner. Waltman finished two places ahead of the Garner-entered Corvette. Good to see so many comments about George and his feats. Like another person mentioned, I knew George back in Great Neck at Scuderia Auto Sport. This was his shop he kept on Northern Blvd. I was young at the time and drove the poor guy crazy till he finally sold me a crashed Morgan plus 4 to rebuild. I have an old MGTD but I always longed for George’s yellow TC with the Brooklands racing screen. George inspired me to love British cars and he inspired me to become a military pilot. For those who don’t know this: George restored a Flying Boat that hangs in the Naval Museum in Pensacola Florida. It hasn’t been mentioned but that lead to his ownership of an old Naval monoplane trainer that he flew during the late ’60’s- early 70’s. This is the period of time when I knew George. Sure wish I was one of his grandchildren waiting in line for one of his treasures. George was a unique individual and I was lucky to know him. George (my Father) did not in fact restore the Flying boat (Curtiss MF Boat),he owned it and inquired about getting help from the museum to restore it,the museum purchased the project from George for $5000 in 1965 and set about restoring it and it finaly went on display in 1968. George’s personal love was his Ryan PT22 that he had from the mid 50’s through till about 10 years ago. Good Morning, Clark Lance and company. Where in N.J. did George Waltman live? We’ve a lot of Garden State racers, from Mark Donohue (Orange and Summit)to Breet Hearn (Butler and Hardeystown), Ted Horn (Paterson resident) and Walt Hansgen (Westfield, White House Station). I want to remember Mr. Waltman on the first anniversary of his passing. Hard to believe it’s been a year. Thanks for all the kind comments, I can hardly beleive it has been a year since my Father was taken.He is greatly missed by my Brother and Sisters. Hi Peter, your sister has contacted me and I am trying to help her locate the car your father drove for Ali Lugo. 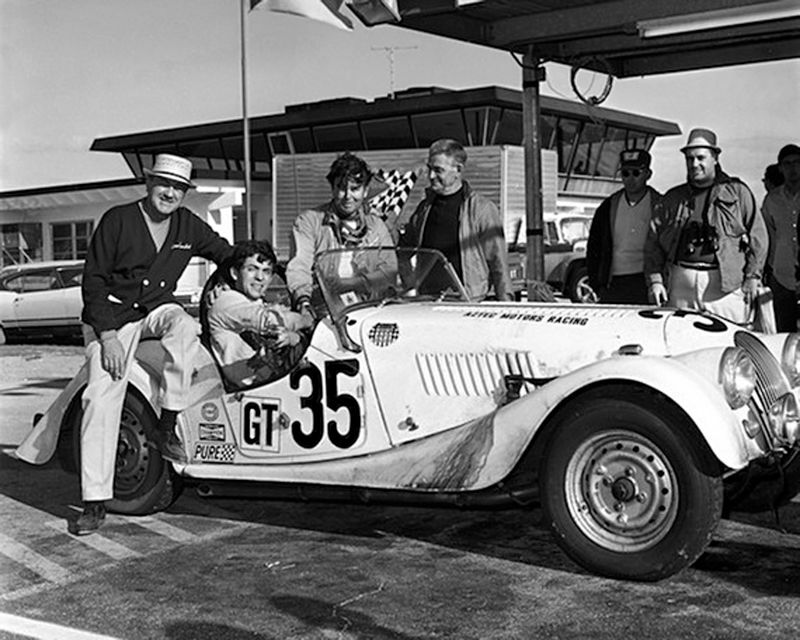 Looking for any info about the Morgan Plus 4 #35 car for George’s daughter, VCR 352. If anyone knows of the car’s whereabouts, I am anxious to learn more. Mr. Galanos; George Waltman was never a pilot during WW2, He was just 19 when he was stationed briefly in Guam as 2nd radio on transporters. In his words, he had an easy war. He was also never a pilot for BA or any other commercial operation, instead he was a member of the ground operations. He used the GI Bill to learn to fly and did so for personal enjoyment only. While his achievement at Daytona may be remarkable, it is hardly worthy of the pedestal on which you are placing him. He was certainly his own biggest fan and promoter and did not have any qualms about embellishing the truth. There was a reason no-one shared the driving that day that has been omitted from the history books.